Krell Illusion II PreAmplifier with Duo 125 Stereo Power Amplifier. Available with Online Finance and Free Delivery. The Illusion II preamplifier - is a dual monaural design with the left and right channels afforded their own power supply regulation and individual circuit boards. All signal gain is executed with surface mount technology using proprietary multiple-output current mirrors with nearly 500 times the open loop linearity of other designs. Featuring 700 kHz bandwidth in a zero feedback, balanced, Krell Current Mode design, the Illusion II shares the same design philosophy as its bigger brother, the flagship Illusion preamplifier. Negative feedback is not used anywhere in the preamp, nor is it necessary. Open-loop distortion is typically less than 0.003%. The volume control is realized with a balanced resistor ladder - bandwidth and transient response of the preamp circuitry are virtually unaffected by the volume setting. The headphone circuitry is identical to the main circuitry, offering private listening with the same performance as speaker playback. 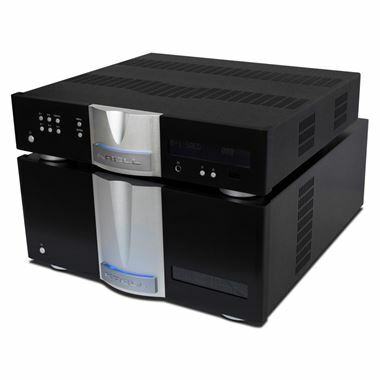 Krell Duo 125 - iBias Class A amplifiers are the first to deliver the rich musicality of Class A amplifiers, the uncompromised dynamics of classic Krell amplifiers, and the efficiency and low power consumption of Class G and H amplifiers. Because the iBias circuit eliminates crossover distortion, the amplifier is able to resolve more of the detail and microdynamics in even the best analog recordings. Simply put, the music breathes. Whether an iBias amplifier is called on to reproduce the extreme dynamic range of high-resolution digital files, the minute intricacies of a 45-rpm, 180-gram vinyl record, or the complexity of today’s latest blockbuster action film, it does so without altering or abating the music in any way. The iBias amplifiers' unprecedented ability to retrieve the subtlest details gives their sound an incredible dimensionality, with an ambient, broad and extraordinarily deep soundstage. As spacious as the sound is, though, the amplifiers are still able to produce pinpoint stereo imaging if the recording calls for it. It's all the power and control for which Krell has always been famous, with a level of resolution and musicality in the midrange and treble that has simply never been heard before. In short, the new patent pending iBias Class A Krell amplifers give today's audiophiles and home theater fans everything they could possibly want in an amplifier.